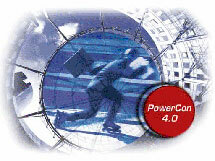 The EverFocus PowerCon Pro 4.0 has been discontinued. No direct replacement is available. The EverFocus PowerCon Pro 4.0 features the ability to have an unlimited number of managed systems (DVRs, network cameras), live and playback view, local storage and printout of video data or single pictures on client PC, multi-window design with scalable video windows. It also has a free-definable multi-iviews with up to 4 DVR systems or network cameras, also mixed display of different DVRs (max. 64 cameras in 1 multi-view with 4x16-channel DVR).